Before starting an app development project, it is nice to know what to expect in the process. What’s even better is knowing how much time and money the project will take. “How much will it take?” is probably the most frequently asked question we get. In this article, we have outlined several key points that will affect the project duration to help you get a better understanding of how long your mobile development project could take. Of course, there is no easy way to determine exactly of how much time does it take to create an app. The short answer would probably be 3-6 months for a mid-size project, from 1 to 3 months for a small simple application, and up to 1 year or even more for a large-scale project. Yet, there are many aspects that can affect the app development timeframe. In order to estimate the possible duration of your project, you need take into account the following. App development time depends mostly on the project complexity and size. Obviously, large, feature-rich projects require more time and effort to be built. It’s impossible to recreate an Uber-like application within a week, but you can easily put together a simple note taking app within the given timeframe. Thus, the type of application and its functionality will directly influence the duration of your project development. However, you can easily manage the timeframe by prioritizing the features and limiting the project scope to build a minimum viable product (MVP) first. This doesn’t mean cutting your app functionality to the bare minimum in order to launch the product within a week or two. You need to identify the most important, must-have features in your project, like photo sharing capabilities for Instagram or the ability to order a ride using Uber, and focus on them first instead of wasting time on unnecessary add-ons. Filters and real-time geolocation tracking features are nice to have, but they won’t solve the user’s problems, which are to share their photos and get from point A to point B. If you fail to prioritize, you might end up with an uncontrolled scope and months wasted on overcrowding your app with functionality. It takes time to build a high-quality application. From a flawless UI and a polished user experience to fast and efficient operations, every small detail in your app should be thoroughly tested before it goes live. It is a common mistake not to include enough time for quality assurance into the project timeline. Depending on the type of manual testing and automation scope, the QA vs development ratio might range from 1:8 to 4:1. Every issue detected by the QA team should be resolved and re-tested in order to make sure the app performs as expected and doesn’t crash unexpectedly. So, aside from development and testing, you will need to plan for bug fixing as well. Depending on the number and complexity of bugs, it might significantly influence the project timeframe. Depending on the mobile platform you decide to target first, your app development timeframe might change as well. Read also: Android vs iOS development: Which platform should I develop for first? iOS is typically a preferred platform to launch the app first, with a small number of target devices and OS versions. It is much easier to make sure your app runs flawlessly on each one of them. With over 12,000 Android devices out there, it is practically impossible to optimize for each one of them. Thus, an Android app development and testing tends to take more time, unless you limit the number of supported devices and screen resolutions. If you want to build apps for both iOS and Android, the duration and budget of your project will double. In business, time equals money. So when talking about software development timeframes, you need to consider the available budget for the project. As stated above, building an MVP allows for a faster release. At the same time, it helps you allocate your resources wisely, so you don’t need to put your project on hold or release an unfinished product if you suddenly run out of funds. With an MVP at hand, you can seek more funding and attract investors to further project development. Another consideration you need to make in terms of budgeting for your app development project is the cooperation model. Fixed price project might seem tempting, but in real life, time and material or a dedicated team model might turn out to be much more cost-efficient, allowing you to achieve more within the given timeframe and at a lower cost. Last but not least, your app’s release timeframe will depend greatly on the development team you decide to hire for the project. By choosing an experienced development team with strong domain knowledge and wide skillsets, you will maximally reduce the development time, while inexperienced developers might spend weeks on even simple tasks. The size of your team matters as well. A freelancer will not be able to finish the project as fast as a dedicated development team. If you hire several remote contractors, their efficiency will still be lower due to the lack of coordination, competent project management and possible gaps in communication. In case you want to build an app by yourself, your project might be at an even bigger risk, unless you are an all in one expert developer/designer/tester. If you lack some of the required skills, it might take months only to get a proper training. Otherwise, your app might turn out to be a huge waste of time due to its poor quality. 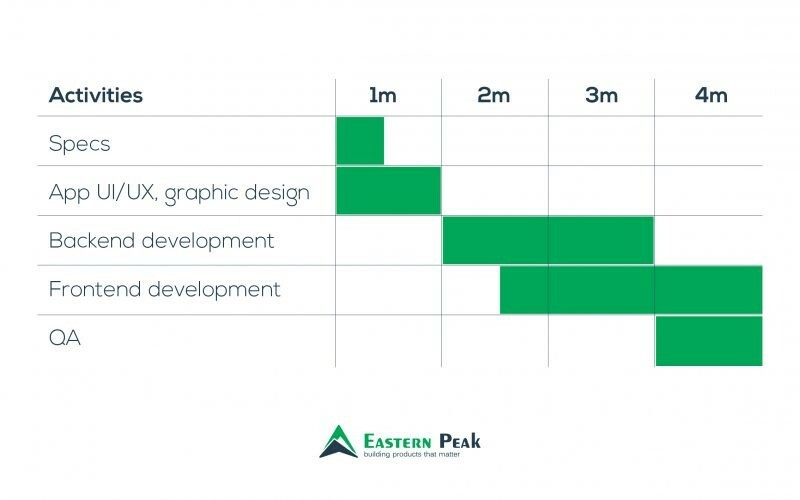 If you hire a dedicated development team with an average of 5 years of experience in the field, professional project management, streamlined workflow, working full time on your project from a modern R&D center, your project development timeframes will naturally be minimalized. Based on their scale and complexity, most projects can be divided into three groups. Each project, regardless of the scope and complexity, includes requirements specification, UI/UX design, coding and testing. If you already have documented requirements or created app designs, your project duration might be slightly reduced. However, it all depends on the quality of the provided assets. In most cases, we will still need to create functional and technical specs to jumpstart the project and make sure your requirements and needs are addressed properly. How long does it take to create a specification for an app? How long does it take to create a design for an app? How long does it take to create a frontend for an app? How long does it take to create a backend for an app? How long does it take to test an app? This is an app development overall timeline which implies that some processes will run simultaneously. The above-mentioned timeframes do not take into account the time needed for project updates and technical maintenance. Software development is not an exact science. There is practically no way to predict exactly how long your project will take. Its duration and success depends greatly on your development team, thoughtful planning and efficient internal processes. All of the numbers that we have listed in the article are based on our expertise in building successful products of different scales. If you want to know how long it will take to build your app, contact us now. We will analyze your requirements and come up with an approximate estimate for every development stage. Prior to starting the development, we create a detailed technical specification and define the strategy in close collaboration with a client. This helps us precisely tailor processes to your needs and determine the project roadmap that meets your expectations and deadlines.